The fully redesigned 2018 Toyota Camry has been turning heads on the streets of Pooler thanks to its aggressive new stance and dynamic curves. The focus on performance is hardly skin deep, though, as the newest rendition of Toyota’s popular midsize sedan is also even more powerful and agile than the one it replaces. Not only that, but Toyota Camrys are built to last as well. Bluffton drivers can see what went into the Camry’s performance bump this year and then check it out today at Savannah Toyota! The all-new 2.5L DOHC 16-valve inline-four features Dual Variable Valve Timing with intelligence (VVT-i) and generates 203 hp and 184 lb-ft of torque. Get even more power from the new 3.5L DOHC 16-valve V6, which also comes with VVT-i and pumps out a commanding 301 hp and 267 lb-ft of torque. 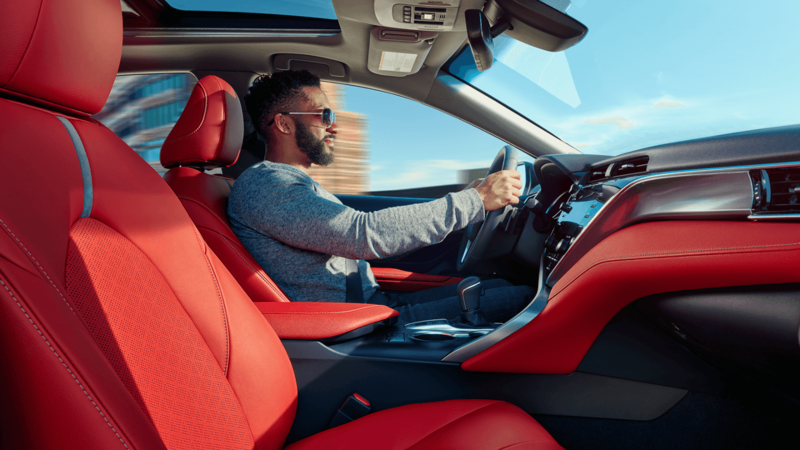 Both engines come mated to a new Direct Shift 8-speed automatic transmission, which helps the Camry achieve better acceleration and fuel economy than the outgoing model. Set your Camry’s performance to your mood and driving needs with the 3-mode drive switch, with special settings for Sport, ECO, and Normal. The 2018 Toyota Camry’s impressive performance doesn’t end with its athletic specs! The wide stance and aerodynamic lines both project and enhance its performance, while the new MacPherson strut front suspension and double-wishbone rear suspension help provide more responsive handling and a smoother, more comfortable ride quality when you’re cruising the streets of Bluffton. On top of all that, the Camry is now able to get up to an eco-conscious EPA-estimated 41 mpg highway. When you’re ready to get an in-person look at Toyota’s latest rendition of the popular midsize Camry, whether it’s the LE, SE, or other trim level, make your way to Savannah Toyota, located at 11101 Abercorn Street in Savannah, GA. We’re open Monday through Saturday, and at our dealership, you’ll find one of the most impressive selections of new Camry models in the Lowcountry. If you have any questions for us, such as how to turn off the maintenance light, feel free to contact us online or call our staff at (855) 411-6139.